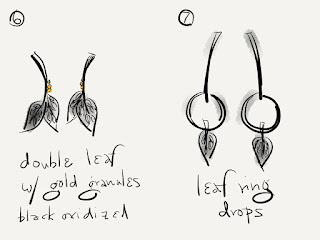 Once the sketches started mounting up, it became clear that the recurrent leaf-on-leaf could be a component. 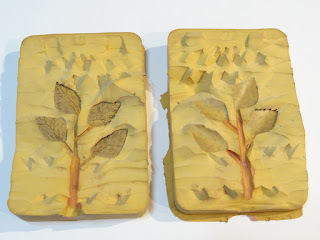 Casting as a way to make multiples is something I've considered for some time, so I finally took two weeks worth of classes at Jewelry Studies International this spring to learn the fine points of making models and molds for casting. 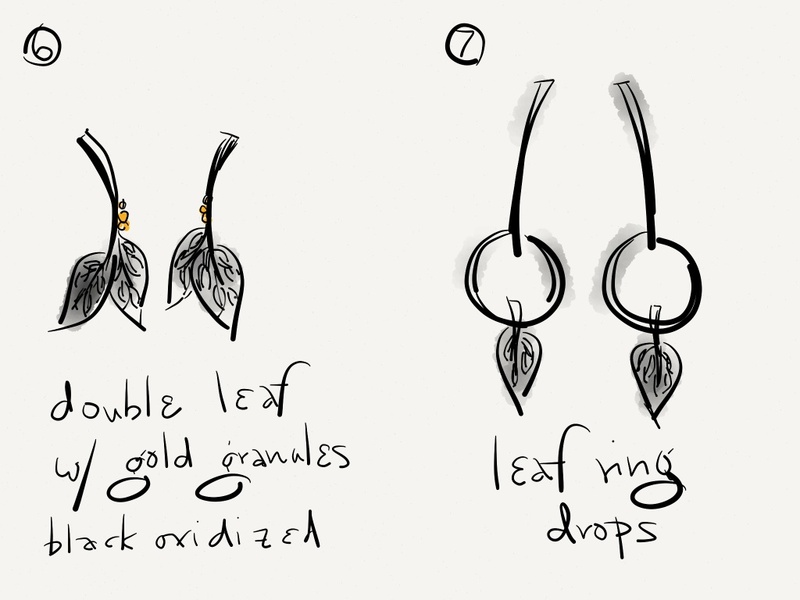 The mold making process involves shrinkage, so I made master models of my leaf components that were larger and thicker than I'd like for the finished jewelry. For metal clay artists, dealing with shrinkage is a normal part of the process, so this is just a double dose of that planning. I made four pieces in sterling metal clay so there would be some variation, fired and finished, then attached them to a metal sprue to act as the conduit in the casting process. (The photo shows the models and sprue after the mold was made, which causes discoloration.) 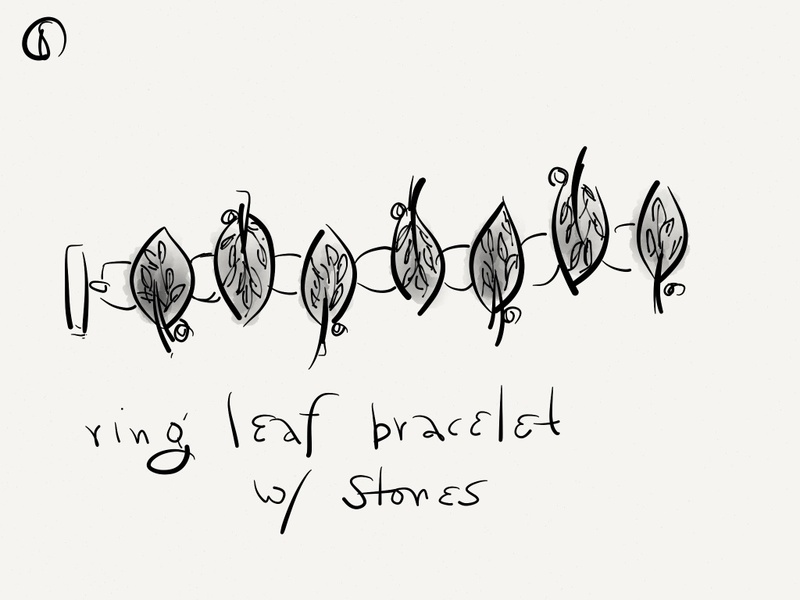 I repeated the process to get large, medium and small leaf-on-leaves. Here's the final mold for the large leaves, used to make injection waxes for the lost wax casting process. 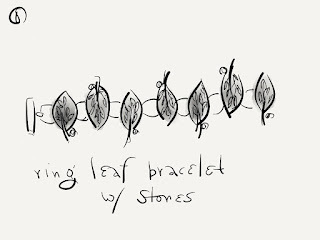 While it's fairly quick to make these leaves by hand using metal clay, even refinement of metal clay takes a lot of time. It's faster to make a set of models, finish them nicely, mold and shoot waxes, attach them to a wax tree, and then cast an entire flask of leaves. 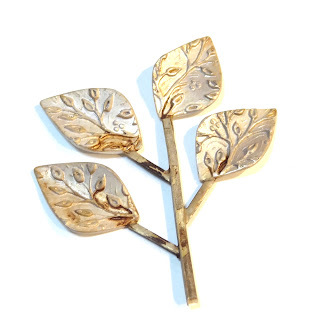 Finishing after casting is fairly quick - clipping the leaves off the sprues and some quick filing and sanding at the attachment points before assembly.